Explore monarchs and the challenges they face as they try to survive in Wisconsin. Students will ask questions, define problems, and analyze data as they learn about these magnificent creatures. Learn what makes and owl an owl during the interactive PowerPoint presentation, and the owls that inhabit Wisconsin. Students will have an opportunity to touch and look at owl talons, wings, and a skull from a Great Horned Owl. The program will end with a short owl pellet disection. Don’t bat your eyes at this one! This program begins with an interactive PowerPoint presentation. During the presentation, students compare their skeletons to a bat’s skeleton, view and discuss bat structure and function and learn about a few common bat myths. After the presentation, the students will take an up-close look at real bat skulls from the vampire bat, little brown bat, big brown bat and the fruit bat. The program will wrap up with a quick echolocation activity and finally an activity demonstrating how female bats find and care for their young in the pup filled colony after a night out hunting for prey. Students will learn what it means to be an amphibian through an interactive PowerPoint in the first part of this program. They will observe amphibian life cycles, and look at some of the amphibians living in Wisconsin and listen to their calls. One student will be dressed to look like a frog to demonstrate structure and function. Students will have the opportunity to take a close look at what mammals live here in Wisconsin. Some will be familiar while others are little known about. Students use the words herbivore, carnivore, omnivore, predator and prey during the “fur guessing game.” A skull investigation will be posed to the students as they try to gather evidence to determine if various mammal skulls belong to an herbivore, carnivore or omnivore. How did Wisconsin become the state we see today? Lumberjacks largely influenced our history. Meet one of our lumberjacks as he shares life stories and shows some of the tools he used to make his living. Students will spend the first part of the time in the classroom, then go outside to learn about lumberjack tools and activities. This portion is hands-on. Travel back in time to learn more about the fur trade and Native Americans during this time period. Students will look at commonly traded furs and one student will be dressed to look like a traditional fur trader from the 1600’s. 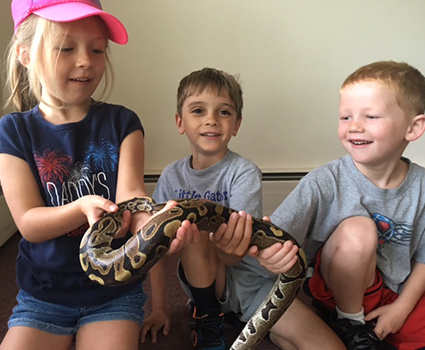 The snake program is a student favorite!! It is no secret that people have long feared snakes. For centuries, snakes have been misunderstood, under-appreciated, even heavily persecuted. However, most of us are enthralled with them and our natural curiosity seeks to better understand them. Students will learn general snake biology and behavior to help them better understand the importance of snakes and their structure and function. We will discuss life cycle, adaptations and look at the snakes native to WI. The best part is that we bring a live snake for students to hold. What is biodiversity? Do wolves have an impact on biodiversity? This is a current issues program as wolves have become a very controversial topic in Wisconsin. During a PowerPoint presentation, students will learn about basic wolf ecology and how populations are studied by scientists and what scientists have learned about wolves by studying them. Students will also do a herbivore, omnivore and carnivore skull investigation, pass around real wolf pelts and use telemetry to track a wolf. calling amphibians and analyze call patterns within the context of atmospheric and habitat conditions. Students learn how to observe, quantify and record how plants change across seasons. They participate in a nationwide citizen science effort to track phenology (seasonal change) and study the effects of climate change on plants and animals. Applying these concepts to conservation issues, they consider supporting pollinator diversity in the local landscape by planting phenologically diverse gardens. Students learn about temporary bodies of water and go on a field trip to map this type of wetland habitat and describe the plants and animals living there. Students will have an in-depth opportunity to learn about twig identification. They will first learn about twig parts and then try to identify a twig.